A critically acclaimed foundational text, Translation in Systems offers a comprehensive guide to the descriptive and systemic approaches which have shaped Translation Studies. Theo Hermans considers translation norms, equivalence, polysystems and social systems, covering a wide range of theorists in his discussion of the principles of Translation Studies. 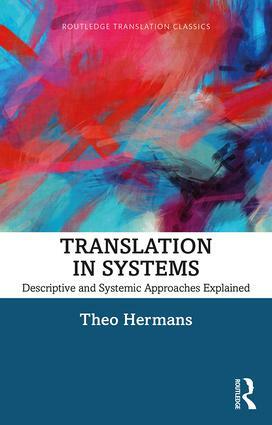 Reissued with a new foreword by Kathryn Batchelor, which updates the text for a new generation of readers, Translation in Systems endures partly on account of Hermans’ vivid and articulate writing style. The book covers the fundamental problems of translation norms, equivalence, polysystems and social systems, encompassing not only the work of Levý, Holmes, Even-Zohar, Toury, Lefevere, Lambert, Bassnett, Dhulst and others, but also giving special attention to contributions derived from Pierre Bourdieu and Niklas Luhmann. Hermans explains how contemporary descriptive approaches came about, what the basic ideas were, how those ideas have evolved over time, and offers a critique of these approaches. With practical questions of how to investigate translation (including problems of definition, description and assessment of readerships), this is essential reading for graduate students and researchers in Translation studies and related areas. "Translation in Systems has been the reliable companion for those who would like to access a clear, comprehensive and critical account of descriptive and systemic approaches - both foundational theoretical frameworks which have shaped translation studies. Almost two decades on, it deserves its place in the Routledge Translation Classics, and will continue to guide and inspire teachers, students and researchers new to the discipline." "Hermans gives us an insider testimony and a critical review of the gestation of the basic principles on which the fledgling discipline was built: descriptive rather than prescriptive analysis, a systemic view of literature, and a quest for norms and laws of translation." Theo Hermans was until recently Director of the Centre for Translation Studies at University College London (UCL). He is now Emeritus Professor in Translation Studies at UCL and an Honorary Research Fellow at the University of Manchester. His main research interests concern the theory and history of translation.